The Connaught Place is often regarded by many as one of the nerve centres of Lutyen’s New Delhi. The bustling colonnades are full of activity – street vendors selling their stuff, ice-cream wallahs, pirated book sellers, couples walking hand in hand, youngsters’ window shopping, tourists soaking in the atmosphere…it is the quintessential activity hub buzzing with energy. Yet, walk a bit down the Curzon Road, past the row of tall high-rise office towers, past Charles Correa’s British Council Library building, turn left into Hailey road and soon you are transported into an entirely different world. It is almost as if you have been magically transported into the Delhi of old, through time, to the Delhi during the Sultanate period. Here, in the backdrop of all the noise and euphoria that exemplifies Connaught Places, lies a serene piece of history – Ugrasen ki Baoli, the stepwell of Ugrasen. Tucked away in this unassuming location lies this beautiful stepwell, almost forgotten by most Delhiites other than couples in love seeking a quiet space or the odd group of teenage kids who come for taking interesting snaps to upload in facebook. Yet, the grandeur of this structure is unmistakable – an immense flight of steps lead down into the bowels of the earth seeking out precious life giving water, culminating in a 4 storeyed arched structure around the well at the north end. The stepwell, built by Raja Ugrasen, measures 60m by 15m. There are landings at 3 levels in between, along the descending flight of steps, each landing with arched niches on either side which could have been used as social activity spaces during the old days. At each of the three levels there are passages to access the arched structure in the end. These levels are a simple but very effective solution, where each level responds to the fluctuating levels of water present throughout the year. Suppose it is the rainy season and there is plenty of water. Then the water would spill out from the well onto the steps and come all the way upto the top level, submerging the lower level niches. In such an instance, the people can have all their activities in the top level itself. Now, when the water progressively reduces with the dry season, the water level in the Baoli also goes down, enabling the lower level niches to be used for the activities by the people. In addition, during the summer months when the water level would be at the lowest, people would have to go all the way down to fetch water. During these times, the niches on the sides of the lower levels gains much more importance as the sun’s direct rays seldom manage to reach down till there (no guesses why the stepwell is oriented in the north-south direction), creating pockets of coolness in an otherwise harsh environment. The evaporative cooling would further help in reducing the temperature. Thus not only is a stepwell an amazing technical solution, but also becomes a very important social activity space for the villagers as well. It is quite amazing that this structure has survived intact the onslaught of time through the centuries. Even today, it exudes a serene monumentality- an air of old world charm, even when the breath of globalisation is just a stone throw away. The Auroville Earth Institute (AEI) is synonymous for Earth Architecture in India. Similar to Hasan Fathy in Egypt, architect Satprem Maine is the face of earth architecture in India. This French born architect came to India almost 20 years back and has now made Auroville his home, from where he has been responsible for the development and propagation of architecture using earth as the raw material, in both India as well as other countries. For his efforts, the AEI has been conferred the UNESCO Chair for Earthen Architecture. ‘Our Mother Earth gives us a wonderful building material, which should be used with awareness, sensitivity and with much respect and gratitude. The Auroville Earth Institute is acting for this recognition’. ‘I don’t see the Earth as a formless material without consciousness, but as Spirit consciously disguised as matter’. There is a school of thought which believes that building with earth is just the right way forward in these times of climate change and pseudo-sustainability. That it makes much more sense to use a material which is available right on the site, which needs no additional transportation, one which needs no additional treatment and energy intensive processing before being used for construction and one which needs no additional makeup after construction and can be left as it is. Earth, as a material has got serious potential, even in the fast paced world that we are in. Let’s not forget that it has withstood the test of time, being one of the very first building materials ever known to man. Our ancestors have used it, experimented with it and perfected the practice of using earth. Yet, our technology driven world has turned its back on it, relegating it as a material for the poor. The paradox is that the beautiful vernacular architecture we find in our rural areas is slowly dying due to this unfounded craze for concrete boxes. It is time we refocused our attention. Satprem has been fascinated by earth as a material and its limitless potential. His body of work speaks for itself – right from simple houses in the various communities in Auroville, to the 4 storeyed apartments in Vikas community, the innumerable schools in and around Pondicherry, the Solar kitchen in Auroville...the list is endless. Through all these projects run a remarkable creative spirit in the use of material to develop different concepts and forms, enclosing space through vaults, domes and arches, creating playful structures which engage you. Disaster housing & earthquake resistant structures are one of Satprem’s major focus areas, again using earth technologies and have been implemented extensively in places like Gujarat, Spiti in Himachal Pradesh, Orissa, Columbia, South Africa etc. What is more remarkable is the passion Satprem has for this, his endless and often lonely struggle to promote earth architecture, to make the people aware of its possibilities, to spread knowledge among architects, students and other people from the construction industry. The AEI conducts regular training courses on various facets of earth architecture – right from basic awareness programs to the more intensive ones. The different residential training programs offer hands-on learning experience on everything related to mud and are highly in demand. Anybody who is genuinely interested in sustainability and earth architecture should definitely head down to Auroville and immerse oneself in the amazing world of earth architecture. Order your copy of ‘TOP 100 ARCHITECTURE FIRMS FOR INTERNSHIP in INDIA’ today. The Centre for Environmental Planning & Technology, established by architect B.V.Doshi in Ahmedabad, has been moulding young students into architects for the past 39 years, evolving as one of the premier institutions for architecture studies in the country. The campus is located in the heart of the Ahmedabad city, in the university area and has been designed by Doshi himself. Doshi and his contemporaries believe that a student of architecture must be surrounded by beauty and art, so that he/she develops into a well rounded creative person, ‘sensitive to the emotional, spiritual, cultural and aesthetic dimensions’. This philosophy is epitomised in the campus design itself, with built and open spaces forming a harmonious whole with nature, interspersed with sculptures, installations and other art works. The language Doshi has used is of exposed brick with concrete, emphasising the slabs and the beams to create a natural coarse texture which has weathered over the years and now almost forms part of the land. The buildings are organised as double storeyed linear masses, open from both sides, letting in plenty of light and ventilation into the studios. In addition, there are inclined skylights on top of the studios, perpetually letting in natural light into the spaces. The studio spaces have bay spaces facing the exterior, creating semi-private spaces which are yet totally open to the exterior - spaces where the individual can be alone with nature even in the environment of a studio. The entry to the complex is through a long axis which ends up in facing a blank wall. One is forced to turn, go down a flight of brick paved steps and turn then again to enter the main wide flight of steps leading up to the library. This forms the main axis, which runs along the side of the library block with steps rising up ever so slowly towards the framed entrance to the library. On the right side is the double storeyed studio block perpendicular to the axis of the library. One gets glimpses of a long framed visual axis running through the open ground floor of the studio block. The levels are articulated to create subtle demarcation of spaces. There are small structures of the wood workshop and the tv room, which helps in containing space. The neem trees provide a perpetual changing pattern of light and shade. The steps in fact become external activity hubs with students using the levels for reading, organising informal discussions, performances or even for simply lazing around. There is a small canteen on the corner of the axis of the studio block. There are external built in seats which encourage discussions and which over the years have evolved into the most active vibrant part of the entire campus. Both students and faculty sit around this space, chatting, discussing and one of the most favourite phrases heard in the campus is ‘let’s have a cup of chai’. This space is a true reflection of the spirit and culture in the campus with a great atmosphere of interaction, informal discussions and learning. And one of the other great thing is that the campus is open to external architects and student architects who flock to Ahmedabad to do their training, thereby allowing them to be part of the atmosphere of this great campus, including access to the great canteen food. The campus is full of neem trees, which, as Doshi keeps saying were planted over the years since the initial phase. The beauty of the campus is that the buildings help in containing the spaces and creates external spaces and platforms, which act as extensions into the open nature. There exists a harmony running throughout the whole campus, building and nature coexisting in a comfortable relationship. With the opening up of the Indian economy in the 1990s and the neo-liberal economic policies followed thereafter, India has witnessed a steep rise in the fortunes of its middle class. There is increased purchasing power resulting in the middle class being more demanding & vocal. The outlook of the middleclass has changed from one of conservatism & savings to one of aggressiveness and splurging. One of the direct results of this is that the outlook of the better-off sections of society has changed. They are no longer able to tolerate the realities of the other half, the less privileged half. The progress of technology, rise of the service sector and the changing values have made them less tolerant to sufferings and hardships of life. They want to be insulated from it, becoming more and more enmeshed in a virtual world, addicted to technology and social networks. The effects of this are reflected in architecture & urbanism too. One of the direct outcomes of this is the rise of ‘Gated Communities’ in most of the larger cities. These are self enclosed spaces, literally separated from the rest of the neighbourhood with high walls and extra security, where along with residential spaces (read apartments) are present all kinds of other amenities like shopping spaces, recreational spaces, swimming pools, healthcare facilities, even kindergarten and schools. There is 24 hour power & water supply with backup present. An army of maids, drivers and service people take care of the maintenance needs of the residents. The result of such spaces is that the inhabitants hardly step outside the gated walls other than for work. They live a life segregated from the rest of the neighbourhood, cut off from them. They do not have to face any of the normal issues and practicalities of living in a city. One cannot deny that there aren’t many advantages to this concept for the inhabitants. The urban dwellers prefer this sort of communities due to their increased stress on security, the comforts that they provide, the 24hour maintenance and service that are offered. These become important for the middle class family as in most cases, both the parents will be working. The hectic work schedules will leave little time to be bothered by additional responsibilities of running a family and home. So, a lot of them take the easier way out, splurging money so that others will take care of these mundane responsibilities. A lot of people who come from other cities often are attracted to these communities, as their hardships in coping with an alien city and language are somewhat reduced in these anonymous communities. This along with the fact that there will be people all around of similar background and class provides a certain element of security. For the individual working women too these communities provide a sense of security. Also, most of these communities have societies which take care of the running of the communities. The societies often arrange get togethers where the families can come together for a Sunday getogether or for a fun filled evening. Yet, other than these, the actual interactions among the residents are often very little, and in a lot of cases, the people wouldn’t know even the names of the family living in the next apartment. Yet, people prefer this false sense of community and anonymity. Lifes' are being compartmentalised. Rigidity is becoming the norm. This aloofness is resulting in the perhaps unknowing creation of gentrification in societies. The communities are literally cut off from the rest of the society surrounding them. They are individual pockets in the urban grain, standing alone. They live in an aloof almost separate world, without having to be exposed to the challenges and cruelties of life. This often leads to the increase in the class divisions present in society, the inequalities are further aggravated. The impact of this on the thought process and outlook of the people are often subconscious, but very real. Thought processes become rigid, plurality is lost and often empathy is totally unknown, leading to further gentrification of society. One of the overlooked impacts this has is on the growth and development of children. The kids who grow up in such spaces lead a much protected life, almost in a cocoon. They are shielded away from normal interactions with people from different backgrounds, not exposed to the sights, smells, sounds and narratives of the rest of the society. Often, their major exposure to the outside world is through the television and internet, where the make believe world portrayed is taken by the children to represent real life. In growing up in such a context, they often are unprepared to face the challenges that life throws up at them, often at a loss even to interact with other sections and accept divergent viewpoints. Also, these gated communities create unrest and resentment in the people living outside due to the inequalties. The open spaces and parks for children in urban areas may only be found inside these communities, which is inaccessible for the outside people. In some cases, the promoters and developers of such gated communities arm twist public administration officials and even bribe them to getting water connections and power lines. This, while the surrounding areas may not be fortunate enough to have even such facilities, creates feelings of injustice and resentment among the outside people. The expression "Agenda 21" was coined at the Earth Summit (Rio de Janeiro, 1992) to refer to the plan of action that states would have to implement in order to transform the current model for development, based on the exploitation of natural resources as if they were unlimited and unequal access to the benefits of those resources, to a new model for development capable of covering the needs of present generations without compromising the capacity of future generations. This is what is known as sustainable development, i.e. development that is durable, efficient and rational in the use of resources and equitable in the distribution of benefits. The final document produced by the United Nations ten years ago contained a chapter (Chapter 28) dedicated to the role of cities in this ambitious resolution for change. It recognises both the responsibility of cities and their capacity for transformation. As has been observed on occasions, seldom have a few brief lines of a formal declaration provoked such an enthusiastic reaction. At present, over 5,000 cities around the world are drawing up their own Local Agenda 21s through mechanisms involving participation by the local community, with the objective of establishing shared objectives and milestones to contribute locally to the sustainable development of our planet's society. Local Agenda 21s are a good example of the old ecologist maxim "think globally and act locally". Barcelona is one of the cities taking part in this movement and it is now completing its Agenda 21. This article aims to outline the characteristics of this complex and exciting process. Barcelona's status as a large city in the context of Europe undoubtedly makes this an experience worth studying and sharing. 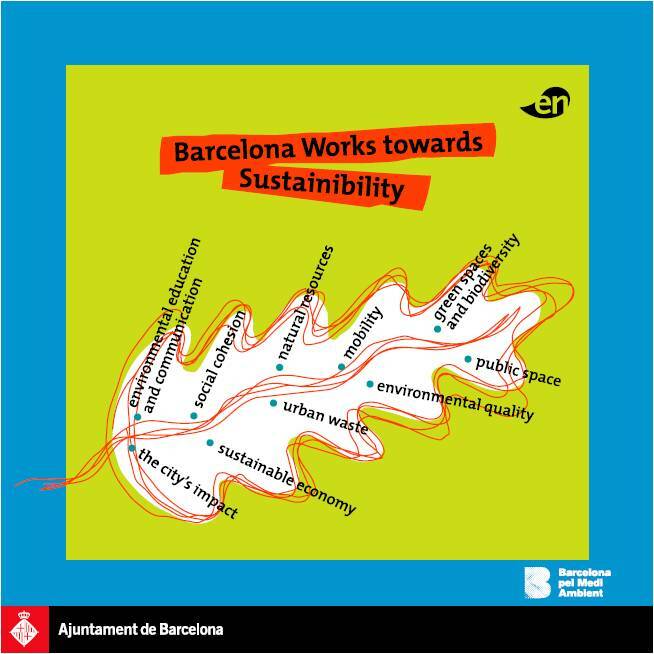 “The sustainable Barcelona of the 21st century has to be a place where solutions are found. These socio-economic, environmental and urban planning-based solutions will preserve and improve the quality and quantity of recreational spaces for the community, ‘people spaces’ – street and squares, parks and gardens and with plenty of green spaces & people friendly architecture. Solutions so that the mixed, compact city that we so desire does not become overcrowded & suffocating. Ways of recovering and re-shaping the urban fabric, emphasising creative rehabilitation and always looking towards the future. Solutions that provide new mobility based on public transport that is equally accessible for al, regardless of destination, with moderate environment costs. Solutions that result in healthier people and a healthier environment, free of waste, with less noise, with breathable air and that is decent for other living beings that share the same space with us. Solutions, therefore, that integrate selective collection practices and waste recovery and recycling; that put a premium on fresh and healthy food; that save water, energy and resources; that minimise the city’s negative impact on the planet and the atmosphere. Solutions, finally and above all, that foster positive social integration and the social well being of people, wherever they may come from”. In 1995, Barcelona's Town Council resolved, with the unanimous vote in favour of all political groups represented, to become a signatory of the Aalbörg Charter. This Charter was the local response to the challenge issued by the United Nations and it was a harbinger of the widespread local movement that would arise in Europe for promotion of Local Agenda 21s. In contrast with the nature of some international declarations, it was an innovative manifesto set out in an attractive style with clearly expressed aims. It was based on the recognition of the responsibility of cities, particularly in the western world, for the current situation (owing to demographic concentration, consumption of goods, services and land, transportation, energy consumption, etc.) and the observation of the capacity of cities to contribute to sustainable development from a privileged position for fostering participation, agreement and mobilisation of forces and resources. Agenda 21 is neither a closed process nor an exercise in exact sciences: each city must select its own approach to drafting its Agenda 21, depending on its characteristics and circumstances. In 1998 and 1999 thirteen thematic working groups were formed with different members of the Council to carry out, on a basis of consensus, a diagnosis of each area, formulating proposals for future action and, in some cases, suggesting indicators for monitoring. In 2000, the Council adopted these documents as "Materials for Debate" and resolved to undertake a phase of citizen participation and debate, through which the Council's work will be opened to other organisations and players and citizens as a whole. This is an extremely important decision for the process, owing to its ambitious nature. When the process is completed, the Council will be the body with the capacity to decide on the approval of the final content. The extension of the debate to include citizens seemed indispensable if the process was to be successful. Making an Agenda 21 with the greatest possible degree of participation not only legitimates it, but above all it allows a larger number of people to assimilate its importance and assume its objectives. At the same time, however, obvious difficulties arise, such as the size of the city, the lack of citizen awareness of the process and the complexity of the issues and the relatively limited time available. The main challenge, obviously, was how to attain a sufficient degree of citizen involvement, taking into account that the move from the core of highly informed and concerned individuals to all citizens could not be made in a single step. It therefore seemed appropriate to focus efforts on fostering the participation of citizen organisations and groups and to leave the door open to intervention by individuals. This decision implied adoption of a participatory approach that ensured that all views were represented, while prioritising quality over quantity. 1. Protect open spaces and biodiversity, and expand green belts. 2. Defend a compact, diverse city, with quality public space. 3. Improve mobility and make streets an attractive place. 6. Reduce waste generation and foster a culture of re-use and recycling. 7. Augment social cohesion, strengthening mechanisms for fairness and participation. 8. Promote economic activity oriented towards sustainable development. 9. Advance the culture of sustainability through environmental communi- cation and education. 10. Reduce the city's impact on the planet and promote international co- operation. The Public complex is situated at a slightly lower level than the Royal complex and houses the Panch Mahal, the Diwan-I-Khas, the Anup Talao, the Diwan-I-Am, the Pachisi court and a few anciliary structures. It is a large sprawling open expanse of red sandstone, bounded by various structures. It is almost as if the red sandstone floor plane is in perpetual contest with the blue sky as to who is more monumental, more awe inspiring, more grand... The buildings form focal points as well as points for physical reference in this expansive courtyard, providing a sharp relief to the monumental backdrops. All these buildings were raised from 1572 to 1585. They were all built in red sandstone in the trabeate beam and post order, composed of pillars, ornamental arches, brackets and chajjas, jharokas and chhatris. Some buildings display elements of indigenous architecture, creating a composite style which is a true reflection on the heterodox leanings of Emperor Akbar. The Panch Mahal is an outstanding structure. It has an air of lightness about it. It consists of five levels of open colonnades, each stepping back from the one below, to finally culminate in a small pavilion on top of the fifth level. The open colonnades and stepped back terraces impart a light feel to this tall building. The view from the pavilion on the very top must be breathtaking, as the land falls away behind to the distant plains. It also gives a vantage point to observe the entire Public complex as well as most parts of the Royal complex. At the centre of the Public complex is the Pachisi court. Here, the grids for the Pachisi game (something similar to chess) is inlaid into the red sandstone flooring and forms a life-size scaled element. The Anup Talao is a cute little pond in a corner of the vast expanse of the Public complex. It is sunken in the ground with steps all around and in the centre is a small platform with jaali screen balustrades on which musical performances were held. This is accessed through four narrow bridge walkways. One can just imagine Tansen sitting in the middle of this beautiful pond, rendering soul touching music to the audience sitting all around on the steps, while the sun slowly goes down and the nightlights come to life. The cool breeze blowing across the stone paved expanse of the courtyard welcomes the dark night. The beauty of Anup Talab is that it is very personal. The scale and design is so personal as to make it a very comfortable space. The Diwan-I-Khas has always held a fascinating curiosity. This structure in the north of the massive complex, appears double storeyed from the outside, with central openings on all four sides on either floor. Yet, on the inside, it is a single large space, double height with a vaulted roof. The remarkable feature in this space is the central column with a profusely bracketed capital. There is a small circular seating space on the top of this column which is accessed by four narrow balustraded passages radiating to the corners of the chamber. The exact function of this structure still remains a mystery and has been variously attributed as a space for religious discourses, as a space for private audiences or even a space meant for weighing ceremonies. The Diwan-I-Khas is the space for the common public. It is a large open courtyard with a colonnaded verandah all around with deep recessed cloisters. In the western side is a space which was used by Akbar to hear the grievances and petitions of the common public. Akbar heard petitions and dispensed justice here sternly and impartially but without harshness or ill will. After Akbar shifted to the Punjab in 1585, owing to political reasons, Fatepur Sikri was practically deserted. There are stories which even tell that this monumental city fell into ruins as the water ran out. However, it is a bit hard to think that the planners and builders of the city, who were clearly master designers and craftsmen, would overlook something as basic as inadequate water reserves. "The Muddy Micromanuals are an invitation to the world of building with earth by four of the most ancient techniques known to (wo)man!" These tiny booklets are designed to deliver just about enough information to give you a flavour of the subject matter, but to keep you hungry for more! And although not strictly necessary, this mucky matter could be consumed with the natural additive provided (for better digestion).. Please feel free to send back comments/ mudballs/ etc.